Cubana Airlines has dropped the price of their May and June flights from Toronto to Santiago de Cuba down to between $278 and $318 CAD roundtrip including taxes. 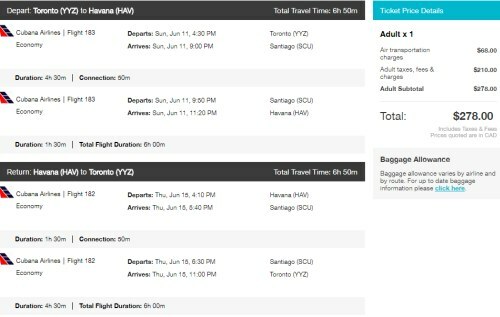 You can also find flights from Toronto to Havana on the same dates, but with a stop in Santiago de Cuba each way. NOTE: It's easiest just to type SCU or HAV into the destination box on Flight Network. Jun 11 to Jun 15 -- new! Jun 11 to Jun 22 -- new! Jun 18 to Jun 22 - new! Jun 18 to Jun 29 -- new! It used to be a lot more difficult for the independent traveler to book their own accommodations in Cuba. It's a lot easier now that sites like Airbnb allow Canadians to book the more independently owned accommodations in Cuba. There are literally hundreds of properties on Airbnb for under $99 CAD/night for 2 people in Havana, Cuba around on these dates. In fact, the average price for an Airbnb in Havana, Cuba is only around $70 CAD/night for 2 guests. 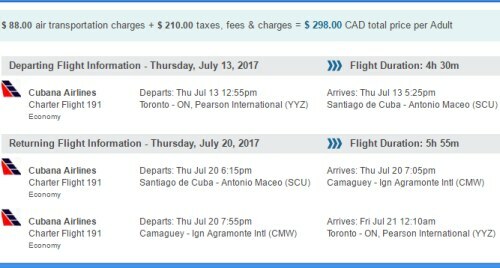 toronto, yyz, caribbean, flight deals, western caribbean, cuba, greater antilles, santiago de cuba, scu, cubana airlines, havana and hav.